Introduction: Many patients receiving news of an unplanned pregnancy need not only a test result, but also the initiation of pregnancy options counseling. Thus, this online instructional module and objective structured clinical examination (OSCE) aim to provide foundational training for medical students in nondirective pregnancy options counseling. Methods: To further the validity of a previously published OSCE, we reconsidered content, revised the checklist, and produced videos for rater training. We also developed a 30-minute preparatory module outlining a stepwise approach and providing a structured opportunity for values clarification. The 10-minute OSCE scenario involves a 24-year-old woman presenting to an urgent care center with persistent nausea who receives the diagnosis of an early, unplanned pregnancy. She responds to the news with shock and emotional silence, asking for guidance. We conducted the OSCE with 46 third-year medical students on the family medicine clerkship. Immediately after the OSCE, students completed a survey and self-assessment, followed by an individualized feedback session with a faculty member. Results: In the self-assessment phase, students reflected on how successfully they utilized methods in the online module for handling emotional silence and presenting options. Student self-identified areas for improvement highlighted use of terminology and their response to difficult emotional encounters in the future. Discussion: This online module and validated OSCE provide a valued opportunity for learners to practice nondirective pregnancy options counseling skills, including screening for intimate partner violence and reproductive coercion, engagement in self-assessment and receiving feedback, and engaging in personal values clarification. Provide nondirective pregnancy options counseling to a standardized patient. Demonstrate the advanced communication skills of handling emotional silence and delivering difficult news. Screen for domestic violence and reproductive coercion. Engage in personal values clarification around pregnancy continuation, abortion, and adoption. The primary objectives of this online instructional module and OSCE are to provide medical students with foundational training in both delivering nondirective pregnancy options counseling and screening for domestic violence and reproductive coercion. We also sought to incorporate an opportunity for students to engage in personal values clarification around pregnancy continuation, abortion, and adoption. The formative, 10-minute OSCE scenario involves a 24-year-old married woman presenting to an urgent care center with nausea and some vomiting, which she attributes to a stomach flu from her elementary school students (Appendix A). She is diagnosed with an early and unplanned pregnancy. The student must give her the diagnosis, and provide the patient with her options. The standardized patient (SP) responds to the news of the diagnosis with shock and emotional silence, later asking the student for input on the decision of what to do next. Delivering news of a positive pregnancy test. Presenting options (i.e., pregnancy continuation, adoption, or abortion). Clarifying personal circumstances, which includes screening for domestic violence and reproductive coercion. Exploring emotions and thoughts related to the options. Offering resources and closure of the encounter. The OSCE is conducted as a formative exercise; students are notified that the only required preparation for the OSCE is viewing the online module. We believe this approach allows them to focus their energies on the genuine challenges of the encounter and their reactions to the patient, rather than concerning themselves with the consequences of a summative exercise. For more details on student preparation, please see Appendix C.
In our case, the lead author, Dr. Carla Lupi, trained faculty to rate the OSCE. The 2- to 3-hour rater-training session begins by giving raters an overview of the OSCE through review of the SP background information and script (Appendix J), the clinical scenario and student instructions (Appendix K), and the online module (Appendix B). The OSCE checklist (Appendix L) is reviewed in detail. Then, raters are asked to rate five rater-training videos (Appendices D-H) demonstrating varying levels of trainee performance using the rater-training checklist (Appendix L). After each video, faculty are asked to share their ratings on each item and, most importantly, their rationale for their choice. See Appendix C for more information related to the rater-training session. It should be noted that a copy of the OSCE checklist with time stamps of where each item falls in each of the five videos is provided for facilitator reference in Appendix I. Any young woman of childbearing age is suitable for portrayal of the SP in this case. Because unintended pregnancy is common in the US, it is possible that women who have a variety of experiences around unintended pregnancy could apply. Some women, owing to lack of sufficient emotional support and/or counseling; and to a cultural climate that causes shame around their decisions especially regarding abortion and adoption, may find portraying this patient overly difficult. Therefore, any potential SPs should be informed of the content of the OSCE before any formal training begins and given the option to decline participation. What do you assume about this patient? How, if at all, does she remind you of anyone you know? What did she do just before coming to the clinic? What plans do you think she might have after she leaves the clinic? What do you think she is expecting from this visit with her doctor? What is it like/will it be like for me to portray this patient? We emphasize that none of these questions have right or wrong answers. The purpose of discussing answers to these questions is to better understand how the actor will portray the patient. To insure standardization, as part of the discussion we highlight challenges the SPs might encounter, such as the use of emotional silence. We have found the use of emotional silence to be one of the most difficult aspects of the SP performance. Some SPs struggle to remain silent upon hearing the news of pregnancy, while some used silence too often throughout the encounter. See Appendix J for the scripted response to news of pregnancy. Once the discussion comes to a close, we give the SPs a 5- to 10-minute break to review the script again briefly and collect their thoughts. We then move to a mock encounter. The SP trainer portrays the student physician, beginning with a high-level of trainee performance. If there are other SPs participating in the training session, we ask them to take notes on the performance. We record the mock encounter for discussion later. We debrief after the performance and discuss strengths and weaknesses. We play back the mock encounter to facilitate debriefing. We then repeat the mock encounter, but this time with a lower level of trainee performance, and debrief again. See Appendix C for more details related to SP training. This OSCE was implemented among 46 third-year medical students completing their family medicine clerkship over a 6-month period. Two different SPs were used. Typically, the OSCE is held in a mock examination room with seating for the student and the SP (the session may also be implemented in a mock consultation room.) Five minutes prior to the start of the OSCE, students are given the clinical scenario and student instructions (Appendix K). They then have 10 minutes to complete the interaction with the SP. Students are given a 3-minute warning prior to the conclusion of the interaction. Immediately after completion of the OSCE, students complete a 5- to 10-minute student survey and self-assessment (Appendix M), followed by a 5- to 10-minute individualized feedback session with a faculty member. A statistical analysis was carried out to evaluate the quality of the OSCE. An independent t test was used to compare the average tally scores by SP. Following the methods of Pell and colleagues,11 the coefficient of determination, R2, was used to examine the linear relationship between the checklist tally and the global rating scale, and intergrade discrimination was used to explore the average increase in the tally score corresponding to an improved grade on the global rating scale.11 A p value less than .05 was considered statistically significant. IBM’s SPSS Statistics version 22 was used for analysis. To provide additional insight into the learning benefits of the OSCE, student comments related to perceived strengths and weaknesses during the encounter were extracted from their completed self-assessments. plot represent maximum and minimum values, respectively. OSCE implementation is ongoing as a mandatory, formative exercise at our institution within the family medicine clerkship, and the large majority of students continue to express the perceived value of practicing this challenging skill set in a simulated environment as a formative exercise. Since initial implementation, we made the decision to have SPs provide feedback and continue the exercise as a purely formative one. To accommodate this, SPs have undergone feedback training by our SP educator. This 1-hour session consists of viewing rater-training videos, a brief review of recommended feedback practices, and role-play of feedback specific to the examinee in the training videos. SPs use the OSCE checklist to guide the content of their feedback. The SP educator provides feedback on the feedback after each role-play. See Appendix C for details related to training materials for delivering feedback. These materials are also adaptable for use at institutions with limited resources. The online module may be used for guided self-study. Educators may then follow this with any number of activities to develop knowledge, skills, or awareness, including discussion or role-play with observer/faculty feedback. The module can also be used for viewing prior to observing or participating in a reproductive health setting. Students at our institution have requested a full video example of an ideal encounter to view in preparation. Although the module already contains significant scripting, we declined to do this out of concern for overscripting students and potentially encouraging a rote approach. In addition, the educational literature does not currently support the use of clear performance models for enhancing simulated performance of communication skills,12,13 and requiring review of a model would increase preparation time without clear benefit. Because the rater-training materials include a clear performance model and others, educators using our materials can easily choose to make these available to students for preparation. Furthermore, items 5a and 5b in the checklist, standard elements in training for giving bad news, may not always be applicable. These items can sometimes feel forced, an issue that arises in other OSCEs assessing communication skills. Depending on variations in the interaction between the particular SP and examinee, they may or may not contribute to a positive outcome for the patient. While we do not know how this patient will respond to the news, the student should at least anticipate a higher probability of negative response based on the fact that the patient is taking oral contraception. With this higher probability, the student should attempt to deliver the news as sensitively as possible. Strategies on giving bad news offers a way of doing this respectfully, even when the news is ultimately received positively. Our own data continue to demonstrate some learner difficulty with asking about intimate partner violence and even greater difficulty asking about reproductive coercion.8 We plan to conduct semistructured interviews and/or surveys to explore the underlying reasons and ask for suggestions to help students overcome these difficulties, with the goal of either revising the module, adding to the suite of materials as necessary, or considering options for better addressing these gaps at other points in our curriculum. Limitations of the OSCE itself include the fact that further validity evidence is needed before its use as a stand-alone tool in summative decision making. We do believe that at its current level of validity, performance data from this single encounter can contribute significantly to the longitudinal portfolio for assessment of advanced communication skills. Performance on this OSCE can also contribute data toward the first of the Association of American Medical College’s Entrustable Professional Activities, to gather a history and perform a physical examination, as the OSCE offers an opportunity to demonstrate awareness of potential bias and the ability to obtain elements of a focused, pertinent history in an urgent setting (e.g., intimate partner violence and reproductive coercion).14 We hope to explore modifications to the global rating scale based on a shared mental model of the outcomes from the patient perspective (e.g., empowerment toward decision making based on her own values and respect) that might not only improve on the reliability already achieved, but focus the assessment on the ultimate goal of the exercise which is to improve patient outcomes. Generalizability could be improved by obtaining input from emergency room physicians, another group of providers who commonly face this clinical challenge. This research was supported by the Association of Professors of Gynecology and Obstetrics Medical Education Endowment Fund Grant Program. Lupi C, Ward-Peterson M, Minor S, Eliacin I, Obeso V. Furthering the validity of a tool to assess non‐directive pregnancy options counseling skills. Paper presented at: Council on Resident Education in Obstetrics and Gynecology and American Congress of Obstetricians and Gynecologists Annual Meeting; March 2016; New Orleans, LA. Lupi C, Ward-Peterson M. Are you measuring what you think you are measuring? The what, why and how of advancing validity. Paper presented at: American Congress of Obstetricians and Gynecologists Martin L. Stone, MD, Faculty Development Seminar; January 2016; Bonita Springs, FL. Association of Professors of Gynecology and Obstetrics Undergraduate Medical Education Committee. APGO Medical Student Educational Objectives. 10th ed. Association of Professors of Gynecology and Obstetrics Web site. https://www.apgo.org/wp-content/uploads/2016/05/APGO-Med-Student-Obj-10-Ed-.pdf. Published 2014. Perrucci AC. Decision Assessment and Counseling in Abortion Care: Philosophy and Practice. Lanham, MD: Rowman & Littlefield; 2012. Committee opinion no. 554: reproductive and sexual coercion. Obstet Gynecol. 2013;121(2, pt 1):411-415. Fortin AH VI, Dwamena FC, Frankel RM, Smith RC. Smith’s Patient-Centered Interviewing: An Evidence-Based Method. 3rd ed. New York, NY: McGraw-Hill; 2012. 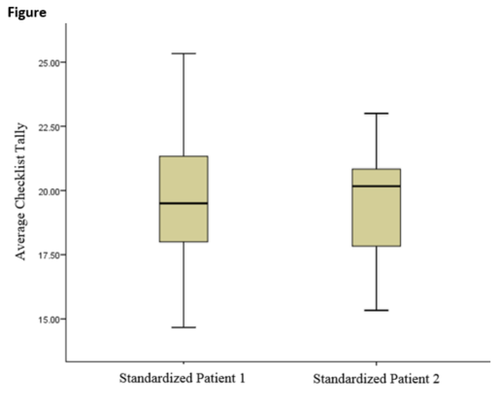 Wallace P. Coaching Standardized Patients: For Use in the Assessment of Clinical Competence. New York, NY: Springer Publishing; 2007. Core Entrustable Professional Activities for Entering Residency: Curriculum Developers’ Guide. Washington, DC: Association of American Medical Colleges; 2014. © 2017 Lupi et al.